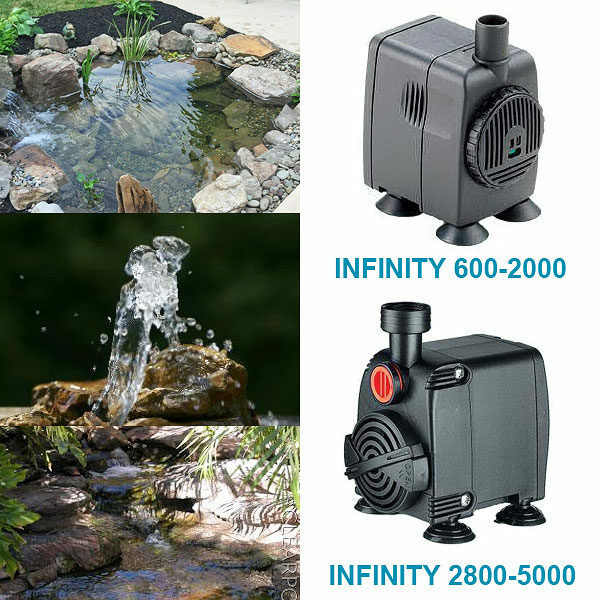 Chosen by Water Feature Suppliers for their compactness and reliability, all CP INFINITI pumps are equipped with a flow control valve and come with a 3 year motor guarantee. Comes in sizes ranging from 600lph (and 600lph for low voltage) to 5,000lph. Limited stock available; we regret that no backorders are available until further notice. The unique technical design of the rotor unit makes the impellor, rotates in two anti friction bearings of special self lubricating material equipped with vibration absorbers. Thus improving quiet running and life of the rotor/impellor system. All pumps are equipped with a flow control valve and come with a 3 year guarantee on motor (12 month warranty on impeller). All low voltage versions come complete with IP44 rated weatherproof transformers for use in outdoor systems. This multi-tasking system is a compact filter unit with integrated UV clarification and fountain/waterfall pump for ponds up to 2,500 litres. Everything you need in one box, including OASE’s clear water guarantee. This all-in-one system is a compact filter unit with integrated UV clarification and fountain/waterfall pump for ponds up to 5,000 litres. Everything you need in one box, including OASE’s clear water guarantee. No power? No problem! These complete pump, solar panel and fountain kit sets come alive when the sun comes out. Sizes range from 470lph to 1,560lph. 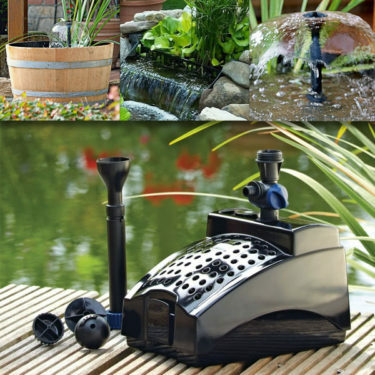 Ideal for small to medium ponds which require a fountain, waterfall or both. 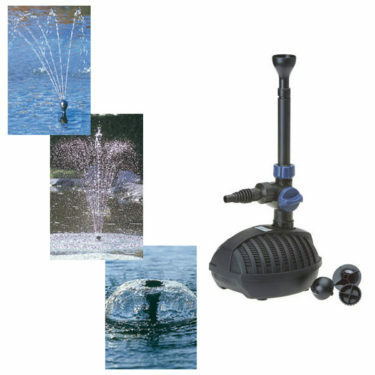 Comes complete with 3 quality Oase nozzles for beautiful fountain effects. Available in 1,000lph, 1,500lph, 2,500lph, and 3,400lph.